VERY IMPORTANT: A SR (support request) is only useful if the problem is reproducible. Therefore check the sample recording before submitting the request. in this cases make use of the support request function. It helps to get well structured information. Make use of the support request function in order to avoid long undetailed mails till all required information are clear. By sending a SR the software will automatically collect all necessary information and build a zip file which will be transmitted to our server. It helps us to reproduce the problem and avoids additional responses to clearify questions. And if we still need further information you have a support request number, which helps to keep your feedback together. How do you get a response? Please abstain from re-requesting according to your sent request and wait for a new software version. We do not respond to any request, but be sure we got it and will go for it. Your request will be stored at your PC and the software will show you requests listed at "Manual & Help" | "Support request". If we have questions we will contact you by the mail address you entered. Therefore make sure it is contactable. 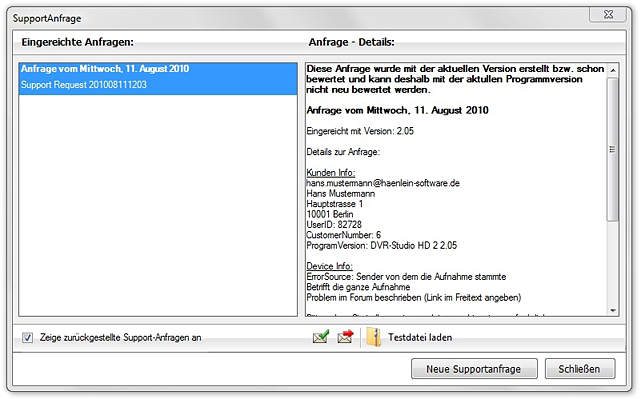 If a new software version is available the update service will inform you. At this step we will discard all requests till we get a re-request by the software. Right after the 10th software startup you will be asked to check your support requests. The button "Load sample file" can be used to open the submitted sample file again to check wether the problem was solved or not. NOTE: This is only available if the sample file was still checked before submitting the request the first time. Submitting a request as "solved" will remove it from the list. Unsolved requests will remain. The support request has a wizzards helping you. 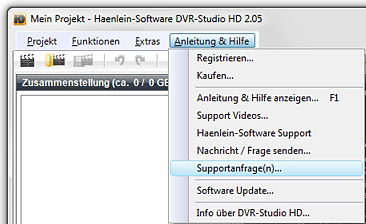 Start at the menu bar "Manual & Help" > "Support request". Please enter all requested information and describe the problem as detailed as possible. If you wrote a forum thread before please add a link to the description and further add the request number (you will get after submission) to the thread. What are the different points good for? A) If no recording is loaded to the recording list you will see a button to add one. (Thus files which are not loadable can be submitted as well). It will only be submitted a part of the chosen file. You can choose 5, 10 or 20MB. VERY IMPORTANT: After data collection you will be asked if you want to load the sample file. Please do that! The error you described may not be reproducible with the short sample file. If it is not reproducible it is not useful for us. Only send a support request with an useful sample file. If checking the sample file leads to a software crash (which might be the problem to be reproducible) you will be asked to complete the request after starting the software again. Press "Complete Request?" to move on. DVR-Studio HD writes all working processes of one program session to a separate log files. The log files help us to understand what was done and where a problem occured. Each software startup will create a new logfile and the latest 10 will be stored at your PC. Each logfile will be added to the support request. Thus even in case of a software crash we will get the log file containing the basic problem. Just add a remark to the request description that the software crashed. Every setting made to a loaded recording will be stored to a project file. These files contain cut areas, error marks, chapter marks, screenshots, menus and some parameters to the recording itself. The project file of the current loaded recording will be added to the support request. This file is analysed and generated be windows. It contains information about current active software, drivers and hardware. In some cases this helps to detect errors caused by outer influences: juddering playback, no preview image, corrupted user interface, disk writer doesn't work, and so on. 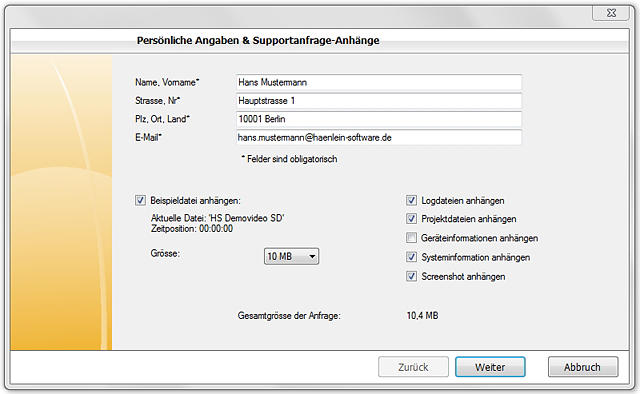 A screenshot of the software window will be added. Thus we can see setup and possible user interface distortions. Add this information if you want to submit a new (unknown) device or if a device export doesn't work as it should be. IMPORTANT: This is a special feature of the support request! The target is collecting information of unknown devices in order to implement a device export for those. Therefore it searches for files containing relevant information about stream structure, managment files, screenshots, EPG information and recording management. Further name syntax, file size and extensions will be collected as well. Some parts of the recording will be extracted as well to get to know if header or footer information were added to the stream. Collection of management files is just based on the file size. Files in KB range will be collected which are located at the recording directory and the superior directory. Known files with extensions like .doc, xls. ... will be ignored. VERY IMPORTANT: Due to the unknown structure it is possible that personal / sensibel data will be collected. Therefore the data is stored to a normal zip file which is placed at the desktop. Please check its content to make sure everything is correct before submitting the request. If a file was collected which is not referred to the device structure you can delete it from the zip file before submitting the request.